Oh my garrrrd, love your mani! Was about to ask where you got the base colour from, ha. Very festive nails indeed! Lovely nailpolish and perfect for christmas, when you not in the mood for the classical red nails. I wear Deborah Lipmann in Razzle Dazzle on my nails. Crystal looks like a nailpolish from Essence that I own. Very pretty! Halima - lol, yeah the base colour doesn't even have a brand or a color name written on it. Sandra - welcome back!!!! When will you get back to blogging? Soon I hope. PS: I'm yet to try Essence polishes, they've just arrived in Australia now but I haven't tried them yet. My gosh Lilit! How to you manage to do such amazing nails!? 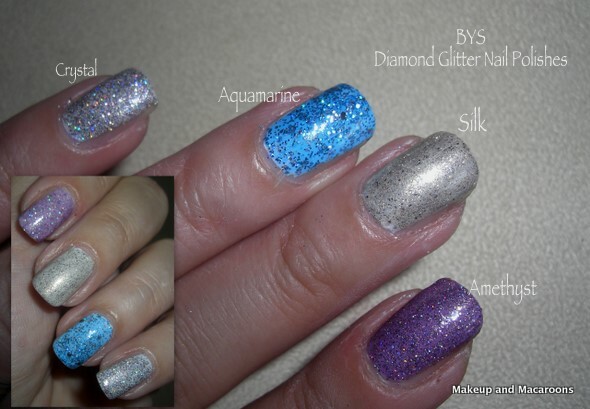 I'm a glitter fan and am loving Crystal and Amethyst on you!! I'm on a super tight budget at the moment but I may be just able to sneak some of these in to my collection. Love love love your blog and reviews! I've just found it as I got a new Mac Lipstick for christmas so im hunting down other mac lippies, and found your blog! New follower for sure!! Oooh! The silk and crystal looks are my favorite!